Employers play an important role in creating the incentives and infrastructure to encourage employees to use sustainable transport. Photo by Dylan Passmore/Flickr. Shifting the daily commute from cars to sustainable transport modes – like public transport, walking, and bicycling – incorporates physical activity into everyday commuting and can improve health and happiness. One study found that if Atlanta, Georgia, had the same level of mixed-use, mass transport, and pedestrian amenities as Boston, Massachusetts, the risk of obesity for its inhabitants would be reduced by 17%. These kinds of health benefits can lower insurance costs for employers and create a happier, more engaged workforce. 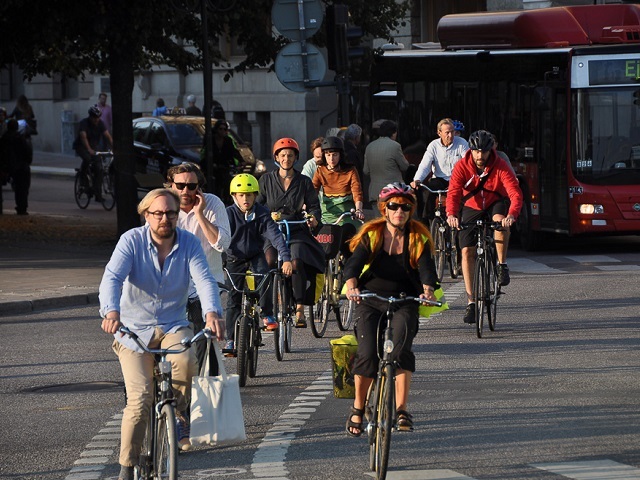 Some worry about the risks of active transport, especially in busy, crowded cities, but a study out of the Netherlands has shown that the benefits of increased physical activity far outweigh the potential risks. All of these facts have employers asking: How can I encourage my employees to engage in sustainable commuting? 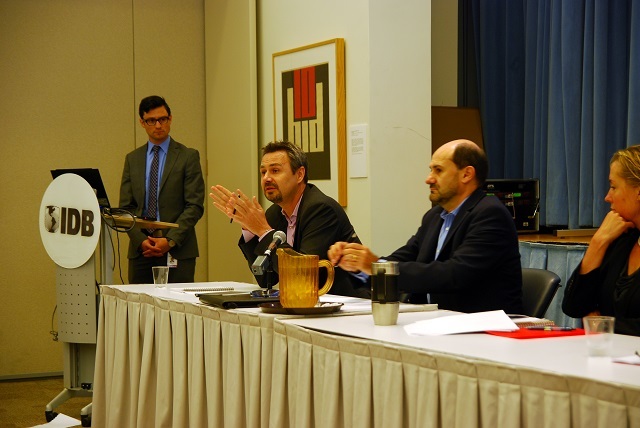 Holger Dalkmann presents on sustainable, active commuting at a recent panel hosted by the Inter-American Development Bank (IDB). Photo by Coby Joseph/EMBARQ. Most public transport providers have programs already in place that allow employers to provide discounted or pre-tax fare cards to their employees. In addition to making public transport cheaper for employees, many employers are able reap tax benefits by participating in these programs. One of the primary barriers to active transport – which includes biking, walking, jogging, and other “people-powered movement” – is available infrastructure at the workplace. By providing access to protected bike rooms, showers, lockers, and other similar amenities, bikers, runners, and walkers can more seamlessly transition from their commute to their workday without having to worry about finding a safe place to park their bike, a clean place to make themselves work-ready, or whether or not their stinky towel or running shoes will be a distraction at the office! For some workplaces, encouraging active transport can be a challenge, especially if they are located far from public transport. In these cases, sponsoring discounted memberships to bike-share organizations can help bridge that extra mile. Though it may seem counter-intuitive, discounted car-share memberships can also encourage sustainable transport use. Some employees would prefer to take public transport or bike to work, but require access to a car for emergencies or for mid-day trips, such as a meeting off-site, a doctor’s appointment, or a visit to their child’s school. With access to car-share programs, employees can still bike or take public transport to work with the reassurance that they have access to a car, should the need arise. Employers can work together with other neighborhood organizations to advocate for transport infrastructure improvements, such as protected bike lanes or expanded bus routes that make sustainable transport more accessible for employees, improve quality of life in the community, and attract new hires. Look no further than TheCityFix to learn more about some of the benefits of bus rapid transit (BRT), transit-oriented development (TOD), and active transport. Some workplaces are simply not suited for active transport or other sustainable transport modes. For example, some workplaces are located on the outskirts of cities or on busy highways. In these instances, encouraging and fostering a carpooling program through sign-up sheets in the cafeteria or a message board on the company’s intranet can go a long way towards getting more cars off the road. Another barrier to active and sustainable commuting is that driving to work and parking at the office can be more cost effective for some employees. One way to disincentivize car use is by reducing or eliminating parking subsidies or cutting the number of parking spaces to increase parking prices. This additional revenue from increased parking fees could be channeled into improved bicycling facilities or subsidizing public transport. Create a sustainable transport taskforce whose goal is to develop informational materials and advocate for sustainable and active transport around the office. Create a sustainability goal for your organization around active or sustainable transport. Sponsor a sustainable or active transport month in the springtime, a pedometer competition to encourage people to walk more, or an active transport competition between departments. Encourage employees and managers to be open to flexible schedules that allow active travelers to avoid rush hour traffic or have more flexibility in their bike-to-work transition timing. Employing any of these methods can help improve the health of your workforce, reduce local air pollution, help reach company-level greenhouse gas emissions targets, and attract new hires to your organization. Let us know how your organization is making changes and encouraging people to get out of cars and experiencing their streets!